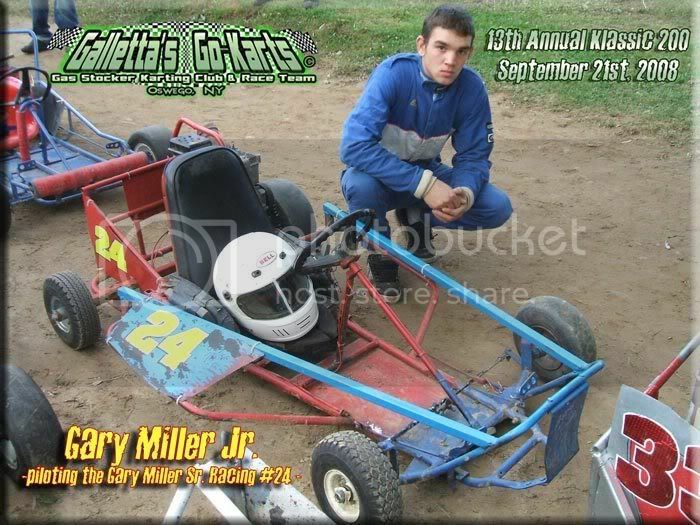 Galletta's Go-Kart Club Driver Profile - Gary Miller Jr.
Karts: His dad's Miller #24 kart, various Galletta's Team Karts. Gary Jr. is a sporadic driver who usually just fills-in for his dad when Gary Miller Sr. doesn't feel like running and when he's in town. He mostly races his dad's kart, but occasionally a Galletta's backup. His driving skill improved greatly between 2006-2008, as he scored his first win in 2008 in the Galletta's #6. 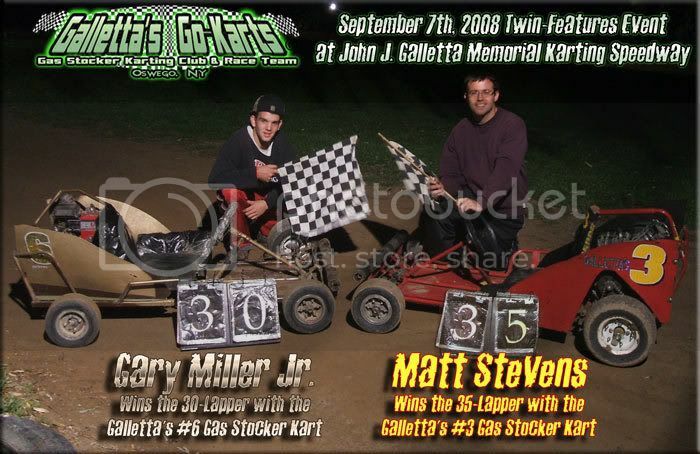 Career Highlights: A win on 9/7/2008 at Galletta's Racing Yard Kartway. 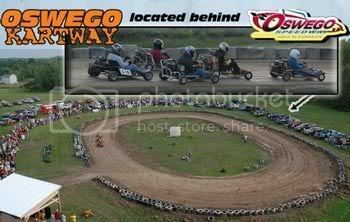 On SUNDAY, SEPTEMBER 7th, 2008, we ran another Twin-Features Event at the John J. Galletta Memorial Yard Karting Speedway. The first 35-Lapper went to Matt Stevens in his Galletta's #3 Gas Stocker. 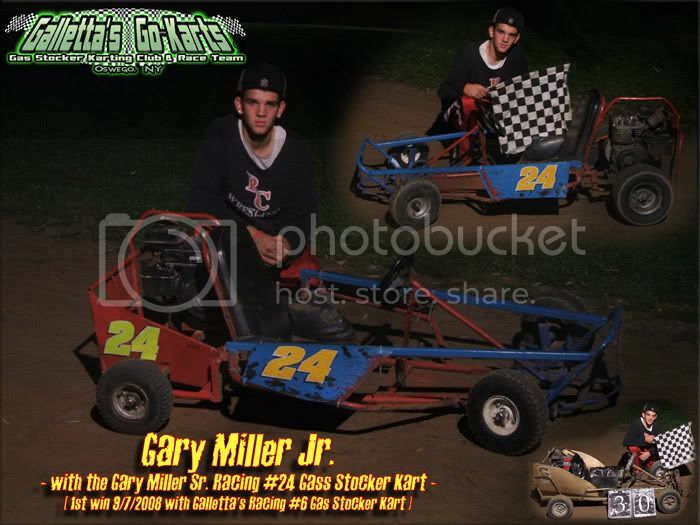 The second 30-Lapper went to Gary Miller Jr. in the Galletta's #6 Gas Stocker; his first ever win! The Galletta's Go-Karting Club was founded by brothers Matt and Chris Stevens in the early 1990s when they modified yard karts for racing purposes. They are the inventors of "clockwise 5hp flathead gas stocker kart" racing, and have a 13-kart race team that includes several backup karts available to be raced at both Galletta's and local dirt kart tracks all summer. Invented with specifically "gas stock 5hp motor" rules so that a person doesn't have to spend thousands of dollars to race in extremely competitive racing events, the class grows in talent and competition every single year. Don't believe us? Try it and you'll see. Join us by building your own kart for a few hundred dollars, or use one of our team karts (small parts/gas donation) all Summer in Oswego, NY!